Satisfying side dish to a sandwich-style dinner. 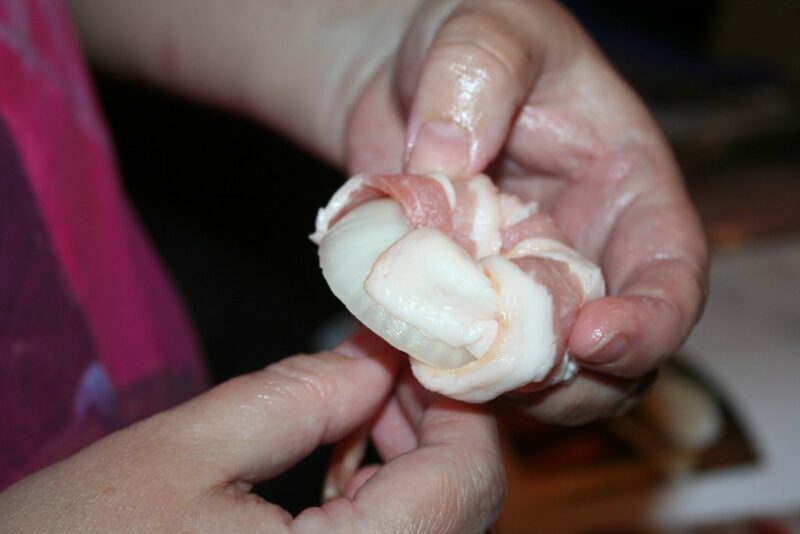 The onion melts in your mouth and the bacon is tender but could be cooked a bit longer to crisp up even more. I used to love onion rings. Yep, I would get them at most restaurants at least once but then the hard part was remembering which ones I loved and which ones I disliked. Love the tower of onion rings at Cheddars! Mmmm mmmm! But the ones at Burger King taste fishy but so do their french fries much of the time; I think they must cook fish fillets in the same grease and then don’t clean it often enough. Enter the ketogenic diet and I don’t eat onion rings any more because of the breading. I saw the ketogenic cookbook by Jimmy Moore and Maria Emmerich at Sprouts one day and decided to check it out of our local library. There were so many recipes in it that I could see me using, that I put it on my birthday list and received it. 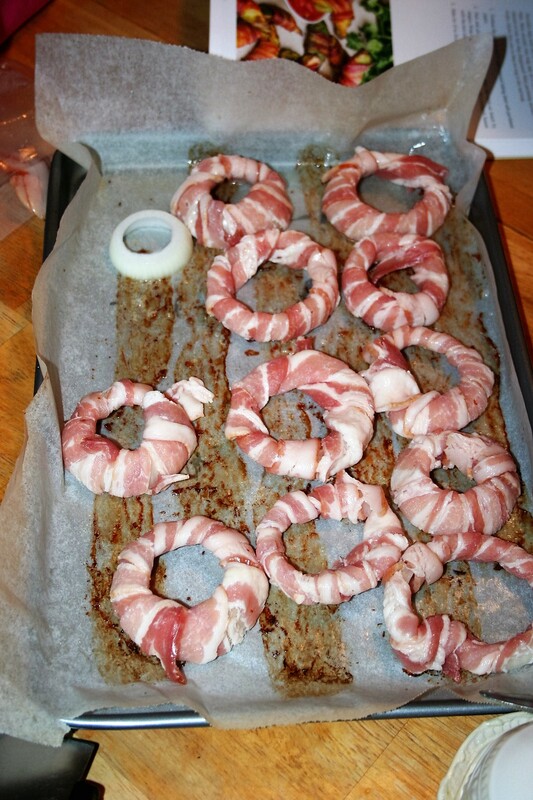 One of the recipes is for rings of onion wrapped in thin strips of bacon. It was very intriguing. I bought a package of thin bacon specifically for this purpose and some sweet onions, which happened to be on sale at Aldi that week. I kept putting it off and putting it off and finally Sunday evening was the day! My dinner plans were all amuck because I changed my mind about what to cook at the last minute (without consulting a recipe) when I went to take the meat out of the freezer to thaw Saturday night. Then Sunday when it was time to think about getting dinner going, I consulted the recipe and found I was missing a key ingredient and did not want to have our first taste of this new recipe be less than the way it was intended. So . . . we punted and everyone willingly fended for themselves. Well, I made Michael a fried egg sandwich. I was up in the air with what to make for myself but had these onion rings tempting me. So I mentioned it to Tiffany and she wholeheartedly agreed! It is soooo simple to do. 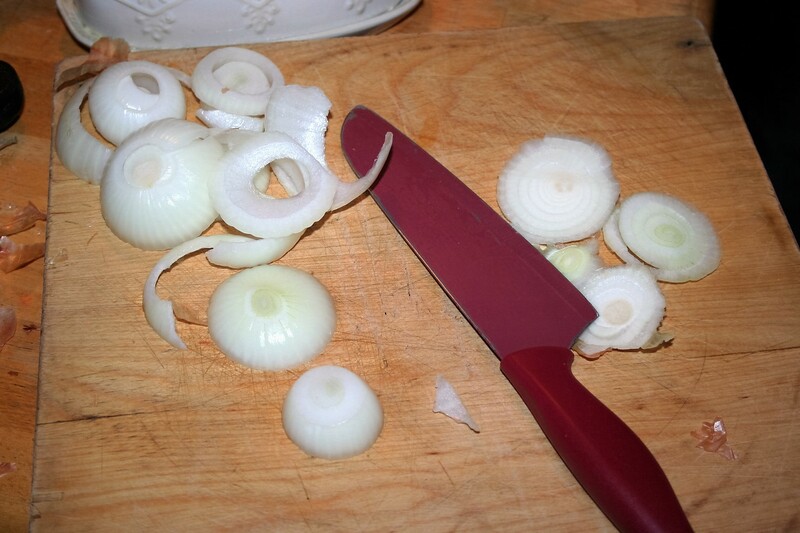 Cut a sweet onion into slices a bit thicker than a half in but not quite three-quarters of an inch. You want them to be as even as possible but don’t stress about it. Tiffany didn’t cut ours very even and they turned out just fine. 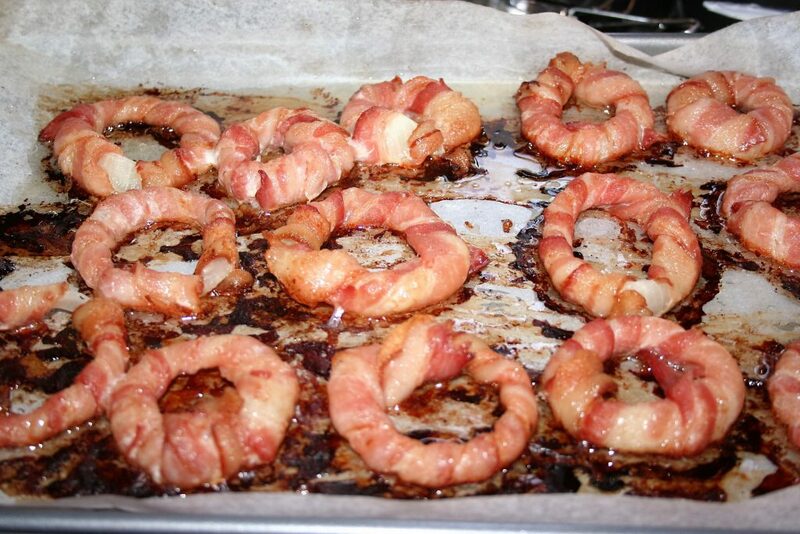 Separate the onion slices into rings and wrap one piece of bacon around one onion ring. That’s it! Lay it down on parchment paper on a rimmed baking sheet. Yep, we had already used this once to bake bacon this morning. Poured off the grease and reused it. Ours didn’t need toothpicks to hold the bacon on but use them if you need to. 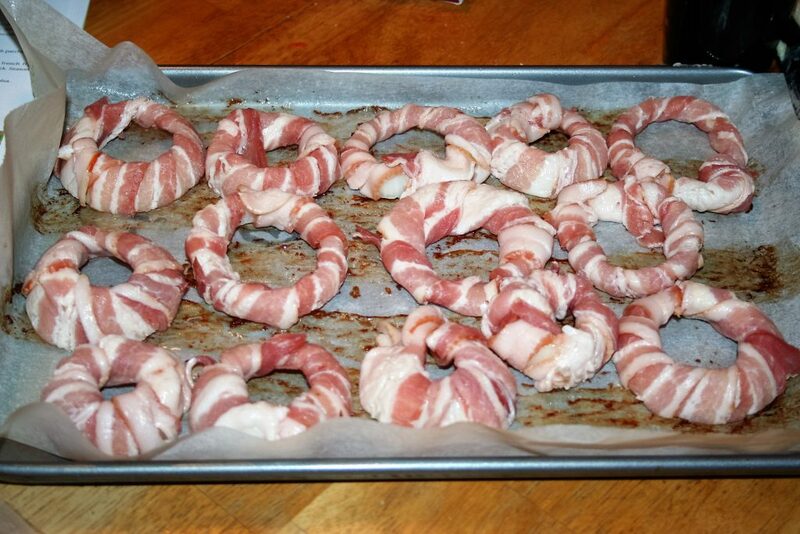 Bake in a 375º oven for 25-35 minutes or until the bacon is as crispy as you desire. These are crispier than they look in this picture. The onion gets nice and soft and the bacon . . . mmmmm, delicious! I wish we had taken more pictures, but we were hungry folks! Maybe next time. Place parchment paper or aluminum foil on rimmed baking sheet. Peel the onion and slice into rings about 1/2"-3/4" thick. 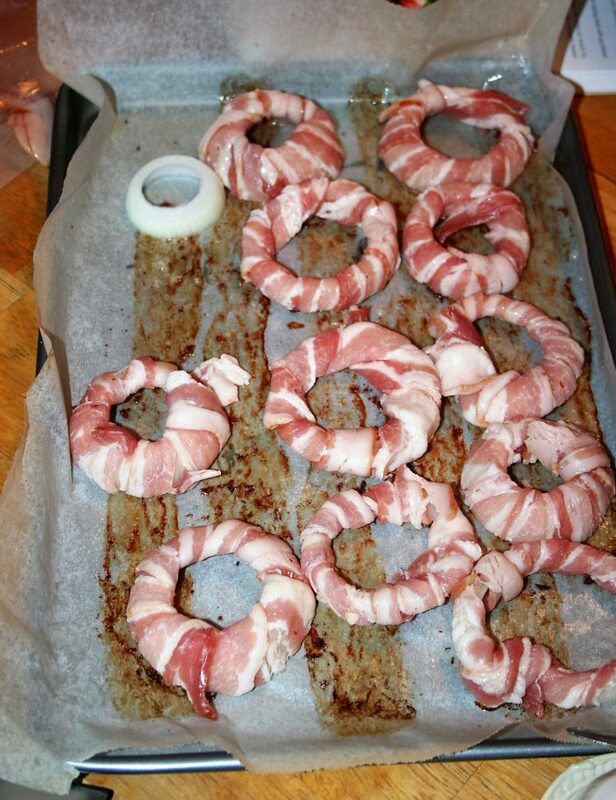 Wrap one slice of bacon around the onion ring. Bake at 375º for 25-35 minutes, or until bacon is done as desired.